Provides pumping, filtration, skimming and overflow components for a pond with a waterfall and a stream. Includes the T75F Filtered Pump Vault. Optional Auto-Fill and Pump Shut-Off Devices are available. For use with waterfall, stream and pond style installation. 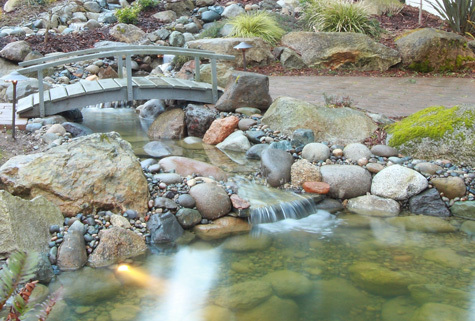 This system is designed for a waterfall and a stream which flows into a pond. Two pumps are included, one for waterfall & stream operation and the other for pond circulation. The system is designed to contain the waterfall & stream water underground when the waterfall & stream pump is turned off. The included skimmer provides a fixed water level. A valve to adjust the water flow from the pump is included. 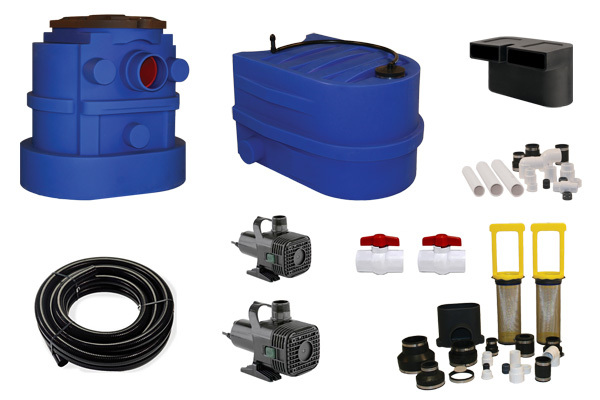 If an external pump or a different submersible pump is to be used instead of the included submersible pump, please contact us for pricing on a custom system. The above photo is an example of a system built by a Berkey Supply Customer using the components included in the Hybri-Pond 1 System. The included Wet Rotor Pump requires approximately half the power draw of standard sump pumps with equivalent output. Housed within the Filtered Pump Vault, the debris-free environment allows for optimal operating conditions. Engineered to disappear into the landscape, the Filtrific components included in each Berkey Pond Kit are compact and built strong enough to be placed beneath natural elements such as rocks and logs. Due to the built-in reservoir, the waterfall pump can be turned off and on as desired allowing for further energy savings. An integrated two-piece lid provides convenient filter access intended for regular maintenance. To perform hardware maintenance the entire lid can be opened with the removal of two bolts. Once the full lid is removed the entire pump chamber is accessible. An optional fish guard includes a frame and grate which can be placed over the included skimmer to prevent fish from entering the skimmer. Floating debris is still allowed to pass into the skimmer through the small slots in the grate. Debris from the water feature is swept into the filter baskets for removal. By preventing debris from entering the pump chamber, the pump and system components are allowed to operate in an optimal environment. Durable polyethylene with structural integration provide a dependable pump vault which can withstand the demands of a rugged job-site. Prevents fish from entering the Small Fixed Skimmer. Adjustable design, constructed of 304 stainless steel. Includes the Rock Support Skimmer Cover (RSC-44) and the Fish Grate. When placed over the Small Fixed Skimmer, the Rock Support Cover provides a solid surface to place heavy rocks or other natural elements to hide the fixed skimmer from view. Adds water to the system when the water dips below a pre-determined level. For use with the T40F & T75F Filtered Pump Vaults. Adds water to the system when the water dips below a pre-determined level. Attaches to a zone on the landscape irrigation system. For use with the T40F & T75F Filtered Pump Vaults. Shuts off the pump if the water level drops too low for safe operation. Prevents pump burnout. For use with 110v pumps. Shuts off the pump if the water level drops too low for safe operation. Prevents pump burnout. For use with 220v Pumps. 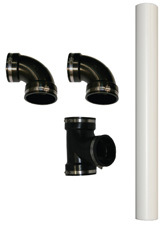 Mounts on a 4" pipe for effective bottom-draw skimming. 80 GPM Max Flow. 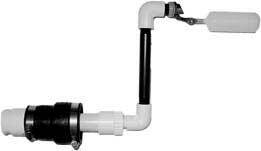 Provides a 6" extension to the lid on the Filtered Pump Vault. Multiple extensions can be stacked to match the surrounding grade. For use with the T75F Filtered Pump Vault. UV Filter housed in 15 gallon vault. 50 GPM Max Flow. 40 Gallon Expansion Reservoir. For use with the T40F & T75F Filtered Pump Vault. Requires either RC-44LL or RC-44LTL Connection Fittings. Connects (1) T40SP Expansion Reservoir to the T40F or T75F Filtered Pump Vault. Connects (2) T40SP Expansion Reservoirs to the T40F or T75F Filtered Pump Vault. Additional system accessories are available in addition to those listed above. Please see the Filtrific Website for details and contact us for pricing.